flyer this stuff works great they run smoother and a bit faster and did I say quieter. I did get this info from this site so thanks for the info. TINGUY, I agree have been using Red & Tacky for a couple years and for about $5.00 you get a life time supply for you & all your friends. Thanks Tinguy and Ray. I just might have to try RnT. I've been using Lubriplate 630-AA for a long time with great success on my engines and those repaired for customers while in the biz. Prior to that I tried LaBelle 106 with Teflon until I found years later it had dried out a bit, stiffened, and changed from slick and creamy to a more putty like consistency. Actually had to remove it on some and replace it with 630-AA. I do, however, still prefer plastic compatible LaBelle 107 and 108 oils. Great and lasting success with them. Would be most prudent to use a lubricant which is ‘plastic compatible’. ...a lubricant which is ‘plastic compatible’. I'm still looking for a non plastic-compatible grease for some testing. Yes that's a problem with most greases, in time they get gummy and sometimes hard, I've been using it in my O gauge and they run really nice now. I bought a tube of RNT yesterday and will soon try it on a dual motor AF diesel with axles bushings, metal worms, and plastic/nylon drive gears. 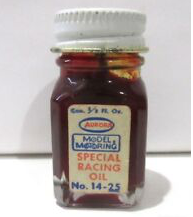 Any chance RNT is the grease (#14-25 Special Racing Oil) that was sold years ago for use with Aurora HO slot cars? It came in a small glass jar like a Testor's paint jar with an applicator. When I opened up my tube of RNT yesterday and put some in a syringe, its consistency and mild odor reminded me of that. Talk about throwbacks. I bought a tube of RNT yesterday and will soon try it on a dual motor AF diesel with axles bushings, metal worms, and plastic/nylon drive gears. Any chance RNT is the grease that was sold years ago for use with Aurora HO slot cars? It came in a small glass jar like a Testor's paint jar with an applicator. When I opened up my tube of RNT yesterday and put some in a syringe, its consistency and mild odor reminded me of that. Talk about throwbacks. Great memories indeed. 2-lane and 4-lane tracks, corkscrew curves, banked turns, hump-tracks, hop-up kits, etc. Those were some fun times. 1. According to info in the above mentioned post, red n tacky will damage bronze bearings. Has this happened to anyone? I've been replacing old grease with red n tacky for several years now but, my trains don't get much run time so I've not had a chance to check on bearing damage. 2. I've seen several references in other posts that indicate AF bearings are oil lite bronze. However, all the bearings I've seen in my trains have the appearance of shiny smooth appearance of plain brass. They do not look like the porous surfaced oil lites I've known in slot cars. Are AF bearings really oil lites? 1. According to info in the above mentioned post, red n tacky will damage bronze bearings. Has this happened to anyone? Not me. I have enough to lube that I am half way through two tubes just on trains. I have two more tubes on garage workbenches at home & at the lake. Thanks Rob. I read the post quickly this morning and didn't realize it was a 2-page post. There's lots of comments on page 2 that supports no bearing damage from using red n tacky. I would still be interested in anyone's comments on my 2 question regarding oilite bearings. My dad and I have used Red and Tacky in all of our trains (O and S) for probably 15 years and it works great. We have never had any problems with it at all. I wouldn't change to anything else. "Whoever dies with the most trains, wins!" MTH Aerotrain: Anyone added details? (04/15/19) Make $10 (or More) from Menards!